Choose your Mass and sign up when the monthly sign up is circulated. Be at Church 15 minutes before Mass begins. Sign-in each time they server, then check with the priest to check what needs to be done to prepare for Mass. Wear "Sunday shoes (black dress shoes)/clothes". 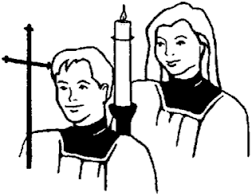 Hang up their vestments after Mass. Pay attention and participate in the Mass they are serving at. Know and say the appropriate responses throughout the Mass.